Udaipur- the city of lakes is a poet’s dream come true. Strolling by the beautiful lakes in moon light; blue water with beautiful gardens around; open air setting restaurants; splashes of culture, color and food all wrapped up in an ethnic charm everything about Udaipur is magical. It has been rightly called Rajasthan’s Kashmir. Touring Udaipur can be like a spiritual awakening or a relaxing therapeutic vacation if you make wise decisions at the right time. Choosing a reputed travel company is one such decision and Om Travel Online is your one stop destination for all traveling solutions. Om Travel Online is a tour operator in Udaipur working meticulously to give tourists an experience worth remembering. Pick and drop facility from airport, railway station or bus stand. Tempo Traveller in Udaipur (in case of group tours). Sightseeing tour in and around Udaipur. Udaipur City Palace: rustic charm, heritage royal past and grandeur in every aspect this palace is more than 400 years old. Inside the palace is a museum to educate you further about the Mewar’s glorious history. 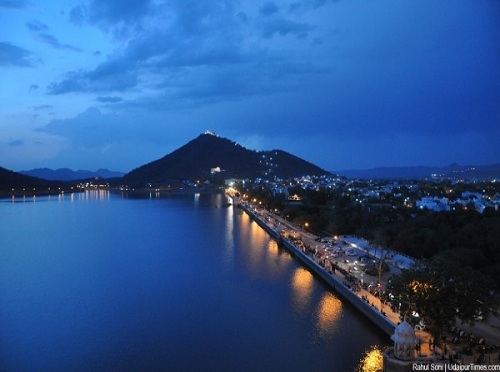 Lake Fatehsagar: a cultural walk-fest Fatehsagar is the most popular tourist spot among lake lovers. With eateries spread around, beautifully painted walls and options like motorboat, speedboat, camel riding, horse riding, water scooter etc. Fatehsagar will keep you occupied till you get tired. Lake Pichola: built in 1362 this artificial lake is home to an island with temple (Jag Mandir) and a palace. Bright blue water with scenic outdoors around and urbane chic cafes afternoon at Lake Pichola is generally breathtaking. Jagdish Temple: the iconic temple famous due to its history, heritage and fine architecture is in close proximity with the city palace. This Lord Vishnu temple attracts scores of devotees from all over Rajasthan due to its significance and beautiful sculpture. Sahelion Ki Bari: with fountains, aesthetically carved shrubs, marble elephant statues, lotus flowers adorning the pretty pond and fragrant flowers soothing the senses Sahelion Ki Bari is one of the most romantic gardens you will ever visit. There are more attractions to explore with like Udaipur Taxi Services such as Badi Lake, Lake Palace, Monsoon palace, Ganesh temple, Sajjangarh Biological Reserve Park, Bhartiya Lok Kala mandal, Rajiv Gandhi Garden, Haldi ghati, Mahrana Pratap Smark, Moti Magri, Ambrai Ghat, Gangaur ghat etc. This is why we recommend at least a three day sightseeing tour so that you get to absorb each and every beautiful moment you spend in Udaipur. A night tour in Udaipur amidst the stars illuminated by moonlight is another spectacular attraction. Spend a full evening enjoying surreal views of the City Palace, Lake Palace and Jag Mandir through a ferry ride. Call us today and get your plan customized!